Habitat Permits Website Has a New Look - Provide Your Feedback! Maintaining sustainable fish and wildlife populations is extremely important to both Alaska residents and visitors. These natural resources play a key role in our economy and in traditional subsistence use, sport fishing and hunting, and wildlife viewing. The Division of Habitat works to protect these resources and their surroundings as the population and economy of Alaska continue to expand. Responsible development can preserve and protect fish and wildlife habitat. 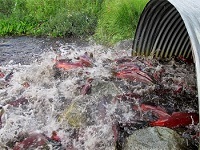 Alaska's fish protection statutes allow the Division of Habitat to protect freshwater habitat for salmon and other anadromous fish and ensure free passage for all fish in rivers, lakes, and streams throughout the state. 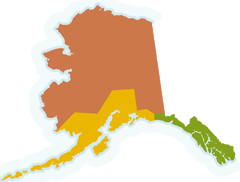 The Division of Habitat is also responsible for developing management plans and overseeing activities in Alaska's legislatively designated Special Areas and works to ensure activities within our state's refuges, critical habitat areas, and sanctuaries are consistent with the purpose for which the Special Area was developed. Many activities in Alaska's freshwater rivers, streams, and lakes and in our Special Areas require a permit from the Division of Habitat. If you have questions about permitting requirements or development projects in your area, contact a Habitat Biologist in your local ADF&G Division of Habitat office. For more information on the Division of Habitat mission, organization structure, and budget, please visit the Division of Habitat Overview. Emergency permits can be issued quickly if there is an immediate threat to people, property, or habitat. If you need to conduct your proposed project quickly because of an emergency, contact your local Division of Habitat office to discuss your emergency and obtain any necessary authorization from ADF&G. Do I Need a Habitat Permit?